Thank you for visiting website for Peartree Way Pre-School, Nursery and Forest School. Peartree Way is the only maintained nursery school in Stevenage and is an integral part of the community in Shephall. I feel very lucky to be Headteacher here, as I have the chance to see children grow and develop into independent learners, ready to take their next step in their educational career, as well as work with a great team of knowledgeable and enthusiastic staff. The children are at the heart of everything we do and positive well-being for all is vital to make strong progress. We are proud to have maintained a very good quality of education following our recent Ofsted inspection in November 2018 and we are ‘determined that pupils will do well’. The first five years of a child’s life are the vital foundations from which all future progress is built on and the dedication of the staff and you as parents are fundamental. Children learn best when they are healthy, happy, safe and secure, when their individual needs are met and when they have positive relationships with the adults who care for them. Other comments from parents are included on our website and I encourage you to read about how other parents feel about Peartree Way – there is no better recommendation for a school than the voices of parents and children. We want every parent to know that their child is important to us here at Peartree Way, and that no concern is too small. Please come in and talk to us about any aspect of your child’s welfare, wellbeing or development; by working together the results will have a positive impact on your child’s development and learning. If you would like to visit Peartree Way to experience the Nursery and Pre-School in action, please ring to make an appointment so we can share the fun and stimulating learning environment. We are very fortunate in Hertfordshire to still have the opportunity to offer Nursery School provision for our three and four year olds. Nursery Schools offer the opportunity for children to spend the year prior to starting school with children of their own age and level of development. This helps their independence, social skills and enthusiasm for learning to develop in line with expectations and prepares them for the next steps on their educational journey. For this reason we provide separate indoor and outdoor areas for our Pre-School and Nursery children. By having both these provisions on one site the children have the continuity of staying with us for up to two years before moving on to school. Peartree Way Nursery School is a 100 place Local Authority maintained Nursery School offering children from 3 years to 4 years a safe and secure environment to become independent learners. We have an intake of new children each September and children are organised in groups of mixed age and ability. We offer two sessions each day – a morning session from 08:30 to 11:30 and an afternoon session from 12:30 to 15:30, five days a week. To assist with sibling “drop-off” times, the first 25 minutes of each session is flexible. Children have the opportunity to work with all staff and in each learning area during their time with us. We also offer parents the opportunity to extend their child’s sessions. Please speak to Mrs Endersby for more information. Children can join us from the age of 2 years and we are able to offer 15 hours per week FREE early learning to children the term after their 3rd birthday (subject to eligibility). These children are given the opportunity to play and learn within small groups with other similar aged children. A designated, well-experienced key-worker will be assigned to your child. These sessions are a great way of starting the Early Years learning journey and preparing your child for Nursery. We welcome any child with a Special Educational Need and parents will be involved in the development of an individual programme to ensure educational and social interaction. For further information, see the separate section on SEND. If you would like to visit our Nursery please contact us to arrange an appointment. We are able to offer all children settling sessions to help with their integration into pre-school and nursery life to help them feel safe and supported as they start their learning journey with us. The children at Peartree Way Pre-School, Nursery & Forest School are “In Safe Hands”. 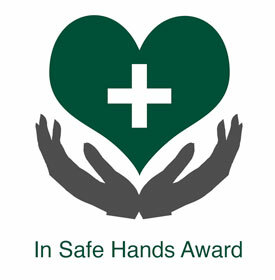 On the 1st November 2017 (expires 31st November 2018) we were approved for the “In Safe Hands Award” which is achieved by quality assurance and numbers of Paediatric Trained First Aiders in Childcare Settings and awarded by The First Aid Industry Body.